In March of 2013, Americans were reminded of a little used, but of late oft-threatened, quirk of political procedure in the American Senate. Rand Paul (R-KY) reached into his senators’ toolkit and pulled out the filibuster. He spoke for over thirteen hours, stopping only to allow a few other senators to ask questions (nominally, at least). The effect was a complete stoppage in regular Senate business. It could consider no other proposed legislation so long as the filibuster endured. The purpose of Rand Paul’s filibuster isn’t important to this article, but I’ll note it here at the outset for the sake of filling in context: Paul wanted the administration to answer whether or not it saw using militarized unmanned aerial vehicles (UAVs) against American citizens on U.S. territory as justifiable under existing law. He worried that the administration saw itself as legally permitted to carry out such attacks. (The administration responded, eventually – albeit evasively – that it does not plan to use militarized UAVs to kill Americans on American soil). 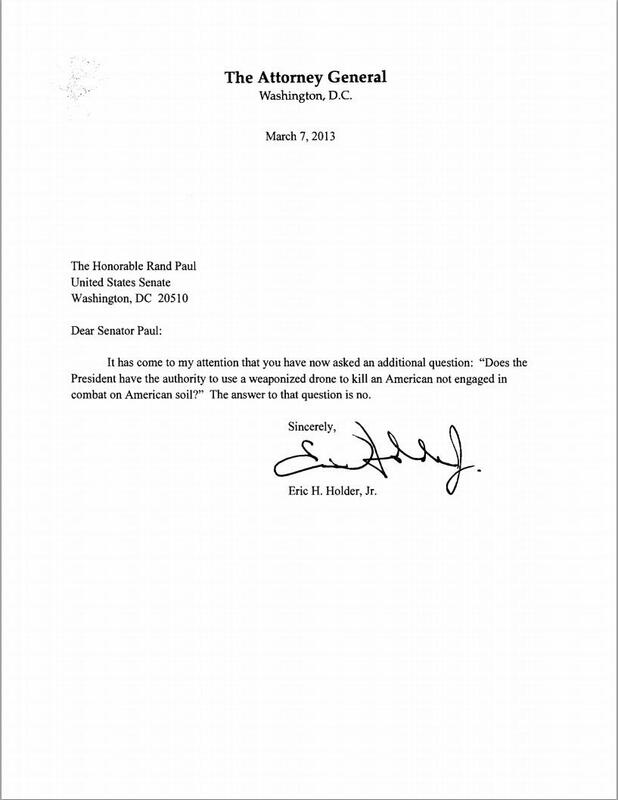 I take no position here with whether Paul’s concerns were warranted, whether his cause was just, or whether the administration’s pithy, 43-word response was sufficient to answer either. (See below for a copy of the response). A consequence of making the filibuster available to senators means that someone representing a tiny minority in the country – perhaps a radical or fringe element of society – can halt the progress of the Senate for a full day or more. In the days and weeks following Paul’s filibuster, many Americans who did not agree with Paul’s concerns or cause asked: Why do we allow the senators yet another opportunity to delay business further than they already do when working under standard operating procedure? My approach in this piece is to answer this question by way of offering a principled defense of the filibuster. My defense is intended to stand irrespective of the conditions under which a particular implementation of the filibuster occurs. In other words, whether or not we agree with the occasion for a filibuster, we ought to support its continued existence in the Senate rulebook. First, I’ll offer a clearer definition of the filibuster. Second, I’ll describe the problem to which the filibuster is a partial solution and defend the notion that the filibuster is a solution to that problem. Third, accepting the premise that the problem to which the filibuster is a solution actually is a problem, I’ll consider three potential objections my point of view. In the Standing Rules of the U.S. Senate, there is an extremely complicated-sounding rule (Rule XXII or “Rule 22”) specifying by what procedure the body of the Senate can end debate on a measure under consideration. In other words, it specifies, among other things, how to stop a filibuster. This rule specifies that the Senate can force an end to debate by making a series of motions over the course of several days, by holding a vote, and by finding that 3/5 of the Senate (currently 60 senators) agrees to end the debate. The option to filibuster – that is, to speak continuously – is open to senators so long as debate on a measure remains open. So, in effect, Rule 22 specifies the rules for filibustering and stopping a filibuster in the Senate. A senator can talk a bill to death unless his colleagues vote to stop him. There is one reason, and it is reason enough, why we ought to support the continued existence of the filibuster in the Senate. Namely, the filibuster provides a preventive mechanism by which we institutionalize a defense of the minority against what John Adams, in “A Defence of the Constitutions of Government of the United States of America,” (1851) and then John Stuart Mill after him, in On Liberty (1860), called “the tyranny of the majority”. Protection, therefore, against the tyranny of the magistrate is not enough; there needs protection also against the tyranny of the prevailing opinion and feeling; against the tendency of society to impose, by other means than civil penalties, its own ideas and practices as rules of conduct on those who dissent from them; to fetter the development, and, if possible, prevent the formation, of any individuality not in harmony with its ways, and compel all characters to fashion themselves upon the model of its own. There is a limit to the legitimate interference of collective opinion with individual independence; and to find that limit, and maintain it against encroachment, is as indispensable to a good condition of human affairs, as protection against political despotism. In other words, the tyranny of the majority is a great risk to individual liberties, and is a danger in particular to those individuals whose habits or commitments are not held by popular opinions. So it goes for defining the problem at hand and the risks to members of the minority if the mob is permitted to rule unfettered. There are a few reasons to take the filibuster to be a solution to the problem posed by the tyranny of the majority. (I feel as though I should clarify that I consider the filibuster to be one solution among many necessary safeguards and not the solution to the problem). First, the filibuster provides an opportunity for a single member of the Senate, officially representing, at times, only a tiny fraction of the nation’s population, to slow or even to stop legislation that would do injury to that small proportion of the polity. This is a case in which slowing progress is virtuous. True, the filibuster is not a full-stop measure against such legislation. It may proceed and take effect despite a senator’s efforts. But at times when a filibuster or threat of filibuster is successful in stopping the legislation in question, the tyranny of the majority is averted directly. (I set aside the legitimacy of allowing the mere threat of filibuster to stop proceedings). Second, the filibuster provides a political voice to the minority. In the absence of this provision, the nation would be less democratic in the sense that not all people would have an opportunity to participate in government, which holds the power to coerce the people. As John Locke maintains, we might think the legitimacy of political power begins with the consent of the governed. Consent may be difficult or even impossible to obtain from every citizen, but I maintain that we have at least an obligation to provide citizens an opportunity to voice their objection to particular instances of coercion. One of the great principles on which the United States was founded – and to which it hopefully still is committed – is the idea that all people in a democracy ought to, at the very least, have their opinion heard. This is especially true when there are people who consider themselves at risk of harm or who see their personal liberties endangered. As is often the case, there will be times at which the filibuster only slows the inevitable march of the progress of the majority’s aims. In such cases, so long as the nation can continue to function, there is no compelling reason not to permit the minority an opportunity to make themselves heard. There will even be times when, through a filibuster, the majority might be brought round to seeing things from the perspective of those [formerly] of the minority view. Third – as may be clear – the filibuster is not a guarantee that the majority will never abuse the minority, but it is a safety measure that we have no compelling reason not to provide to the minority. As a general principle, that we cannot completely stop a bad thing from happening is no reason not to take minimally-deleterious steps to prevent that bad thing from happening. Phrased differently, we ought to take minimally deleterious steps to prevent bad things from happening, even if those steps are not a guarantee against the occurrence of those bad things. In this case, the “bad thing” is the tyranny of the majority. For another application of this principle, consider an analogous argument in favor of universal background checks for gun purchasers (in development). In short, we have strong and several reasons for continuing to permit filibusters in the Senate, while we have weak and few reasons against continuing the practice. At risk of over-extending the length of this entry, I think it worthwhile to consider a few likely objections to my argument. I do so in brief in this short section. One potential objection is that we have other checks on the power of the majority in government. A straightforward response is that the tyranny of the majority is so terrible a risk to any democracy that, so long as adding more checks on the power of the majority do not halt the necessary functions of government, we ought to provide as many institutionalized protections for the minority against the minority as we are able. Because the right to filibuster is not absolute – a filibuster can be stopped – the opportunity to halt government by the sheer force of the will on the part of a small minority cannot, practically speaking, halt government. This is not to say that it couldn’t do so in theory, however. It could occur in a case in which the senator or senators representing a minority chose to filibuster every piece of legislation that the Senate considers. However, the requirement that the filibustering senator actually hold the floor for the duration of that senator’s filibuster makes constant filibustering practically impossible. It is not a live concern, in other words. When it happens, we should take it seriously – the Senate, after all, can amend Rule 22 any time it wishes. A second potential objection is that the filibuster empowers fringe elements of society, empowering them to assert control it would be undesirable to award them. My response, in short, is that there are empirical examples of cases in which the fringe element was the one that required protecting. We can consider any case in which oppressed and impotent groups of people were mistreated by the government or by other citizens (e.g. slaves, women, people with particular cultural or ethnic backgrounds, etc.) to see that what appears to the majority to be a dangerous fringe element of society in fact has a legitimate claim to have its concerns considered by those in power. That we aren’t very good at judging when this state of affairs obtains is reason enough to extend the right to filibuster to all representatives in the Senate. As usual, I welcome any feedback, friendly criticisms or amendments, and/or other comments. This entry was posted in Political Commentary, Political Philosophy and tagged Alexis de Tocqueville, American Democracy, Filibuster, Freedom, John Locke, John Stuart Mill, On Liberty, Personal Liberties, Plato, Political Philosophy, Politics, Public Policy, Rand Paul, Republic, Socrates, Tyranny of the Majority, U.S. Senate. Bookmark the permalink. Hey! Thank you for the post. I have a question for you (if you don’t mind), though, I warn you, it isn’t directly about filibustering. My question isn’t so much about why we need a defense against the “tyranny of the prevailing opinion” through filibustering, but rather this: why and how do our opinions become tyrannical? Why do we, attempting to govern ourselves with some goal in mind, run the risk of alienating ourselves as a people? As you mentioned, well known political philosophers have included this protection against the public opinion into their conceptualization of what a government should and shouldn’t do. Why does this type of skepticism (if we can call it that) seem to be necessary to our understanding of government? When you refer to the we in the “why do our opinions become tyrannical” and “why do we… risk […alienating] ourselves as a people,” you’re thinking of us as if we were a single entity – that we were one body, and that one was somehow divided within itself. This might be a reasonable way to think of things, if we allow for that single metaphorical body to be of more than one mind, which is how the founders (and philosophers) often thought of it. Just as a[n actual] person can be of two minds about something (e.g. “I want to lose weight and I want to eat this cake” or “I like Jane and I somehow also dislike Jane”), so too can a political body. There’s good reason to remove the abstraction and metaphor – that is, drop the notion of a single body politic – and instead think of society as a collection of individuals. If we do this, the high likelihood that we’ll be split in our opinions becomes clearer. In fact, the single-body metaphor is a poor one, because we have a tendency to think of the body as naturally well-functioning – as not likely to be fighting itself to the point of death. In fact, political bodies do this on a regular basis, and the mere fact that we belong to the same body politic does nothing to guarantee our survival as a group. In fact, we are a collection of individuals whose interests often diverge or run counter to one another. The effects of our pursuing our own interests can sometimes run to the extreme contrary of another person’s interests. The point at which our opinions become tyrannical is precisely the point at which we (you and I, for instance) become members of the majority and our opinions about how the government should operate differ from the opinions of those in the minority. Because (thank heavens) we do not live in a direct democracy, we (you and I, of the majority) cannot simply steam-roll those in the minority anytime we differ in our views. If those in the minority feel strongly enough about their [usually lost] cause, some of the institutional checks on the power of the majority built into the American constitutional republic provide them a means of being heard (before they are trampled in the end anyhow). It’s not perfect – in fact, I’d love to see additional checks put into place – but it’s better than straightforward democracy, so far as the tyranny of the majority is concerned. Well spoken. I am not sure how to ask my question, but I will try. I think, if I understand, it’s not so much about being cyncical towards the government and treating “us” as a single entity, but being pragmatic towards the difficultly of being governed as individuals desiring different governmental preferences? At bottom, the argument in favor of [opportunities for] obstruction and delay is indeed about pragmatism. That is, we ought to support whatever reasonable means we can take to minimize the damage done by the majority toward the minority, given that we’re nation made up of many different people who have many different interests, some of which would be harmful to others if attained without interference (or attained at all, depending on the interest in question). Thank you Steve. Your posts and responses helped me understand your post. I appreciate it.